On the 21-22 June, I was provided the opportunity by World Bicycle Relief (WBR) to join Team MTN-Qhubeka, the first African Pro-Continental road cycling team, on the final day of the Tour de Suisse.The exclusive VIP experience would gain me unique access to the team, dinner the night before with Team Principle Douglas Ryder and the highlight – a seat in the team car alongside Director Sportif Manel Lacambra for the final race day. Excited didn’t even come close to my emotions! I met Kristina Jasiunaite, Managing Director of WBR (Germany) in Verbier on the 21st June. We would be staying that evening in the alpine resort and also attending the finish of Stage 8 in town. Having met Kristina a couple of years back on the Trois Etapes cycle event, I was immediately struck by her passion for the work of WBR and Qhubeka in introducing bicycles into under-developed African communities. 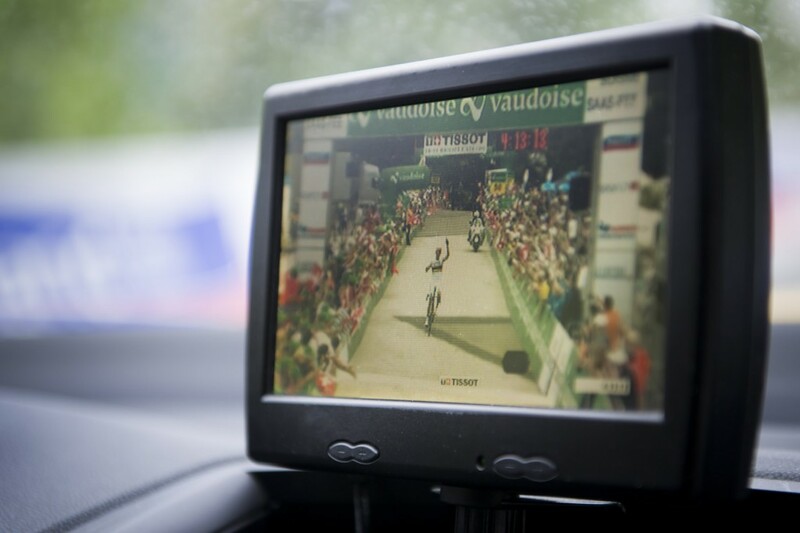 We headed to the finishing straight in Verbier where we took our positions in the VIP area. As the race entered the last kilometer, the whirring of the media helicopter and roars from the crowds started to amplify. Leaning over the barriers we then caught site of Esteban Chaves from Orica- GreenEDGE. He had broken free of the pack and was heading to collect the stage win just meters from where we were standing. Soon after this, Sergio Pardilla and Louis Meintjes from Team MTN-Qhubeka took 16th and 19th respectively alongside big name tour riders Cadel Evans and Tony Martin. Later that evening we headed to Martigny to meet Team Principle Douglas Ryder. You would be forgiven for thinking that meeting a team principle would be a nerve-racking experience – not wanting to ask the wrong questions and wondering whether the team really had bigger things to worry about than entertaining a fan before the final stage of a World cycling race! However, I soon felt at ease when we found Doug on the team bus and he immediately took us under his wing. Doug was delighted to see us and show us his team. We were first shown the bike store which is guaranteed to excite any cycling fan! 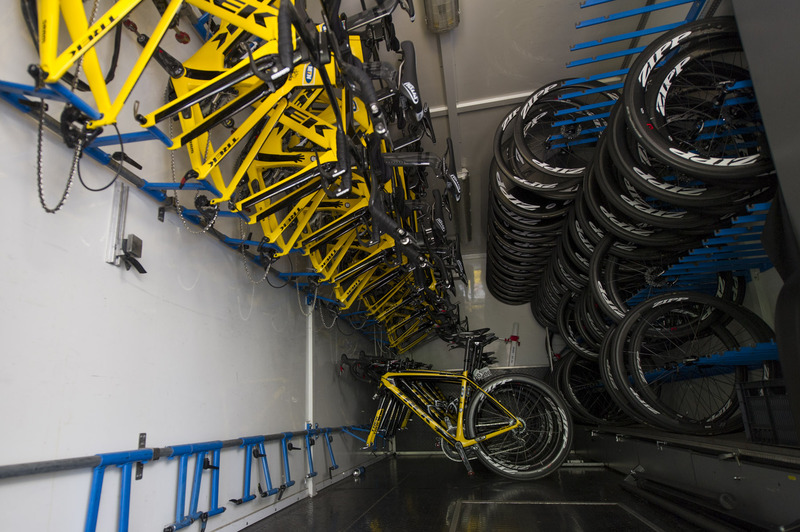 This purpose built-truck contained the latest Trek bikes, more Zipp wheels than I could imagine and a vast array of SRAM components and spares. As we were being shown around, I saw hundreds of thousands of pounds of gear carefully being cleaned, re-tuned and assembled by the team mechanics, all of whom were happy to stop and chat for a brief while.Doug then introduced me to the other team members before we headed to dinner where we would meet the riders and have the opportunity to quiz Doug on everything – from tactics for the next day to his history in setting up the first African cycling team – it was a fascinating evening. The following morning Kristina and I would join the team early to sit in on the team briefing. 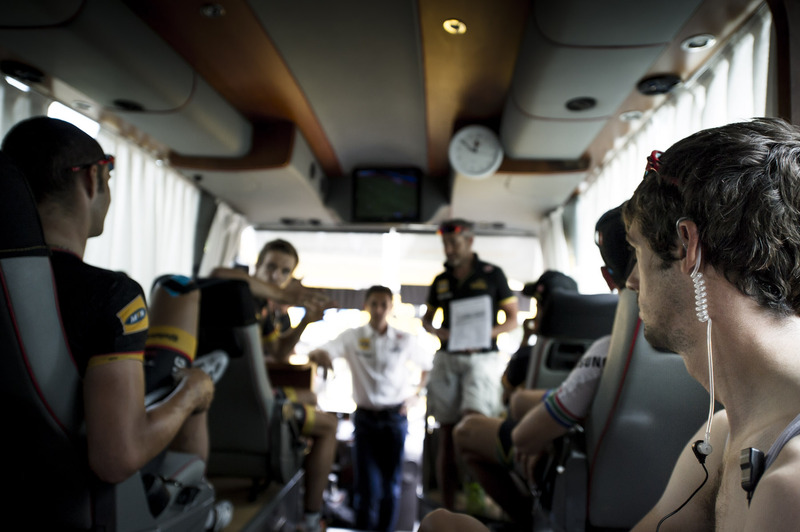 Climbing on board the customised yellow team bus, we were sitting among the riders as Director Sportif Manel Lacambra explained the day ahead and his planned tactics for the race. To be present at the team briefing was a true privilege – hearing Manel’s predictions, seeing how he interacts with the riders and motivates the team, witnessing the dynamic between the riders, coupled with Doug’s enthusiasm at being an African Pro Continental team competing with the ‘big boys’ on the Tour de Suisse – I simply couldn’t wait to jump in that team car and start the race! After a few customary team photos, the team bus departed and the riders rolled out down to the start line in Martigny centre. The race would start in 30 minutes, just enough time for me to walk with Doug and Kristina down the paddock area and check out all the other teams. Here you would find the likes of World Champion Rui Costa warming his legs whilst Ben Swift and Mark Cavendish made a few final adjustments to their machines. Cycling is one of the only sports where you can still get within touching distance of the World’s biggest names – something I hope is never lost. The race was about to begin and you feel the anticipation in the air. 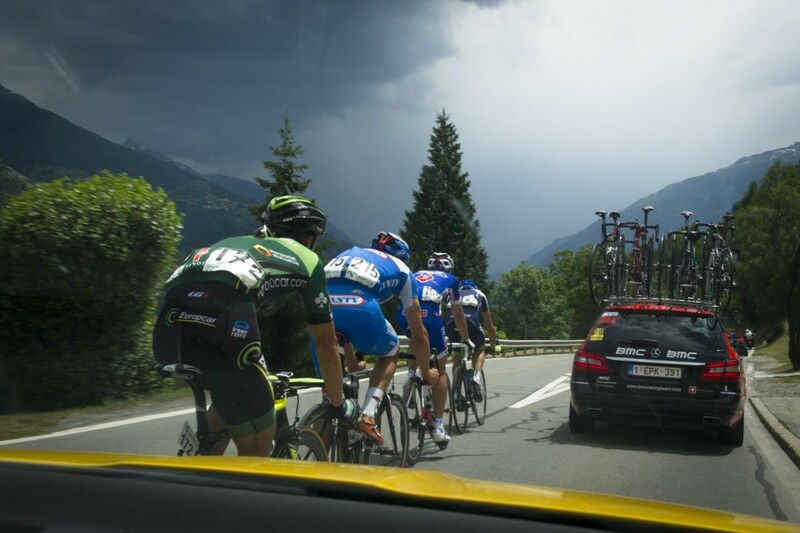 I jumped in the front seat of Doug’s car and before I could blink we were speeding through the pedestrian lined streets, over the start line and out into the countryside heading towards Sion – the peloton was already clocking 60Kph! Doug would be driving one of two team cars, the other driven by Manel. Doug had suggested I accompany him for the race as he would be following any breakaways that day. However, cycling is a sport where things can change very quickly and within 15-20 minutes Doug could see that the plan was going to be somewhat different. He radioed ahead to Manel and they agreed a place to stop so that I could quickly swap cars. Although the race was in full swing, Doug knew he would need stay at the back of the race to assist a couple of struggling riders and so wanted to give me the best day possible by putting me up front with Manel. I soon saw that this thoughtful behavior was typical of Doug and was struck his kindness and generosity of character. As I jumped in with Manel I could barely click my seat-belt in before he sped away down the opposite side of the controlled road past the peloton to catch the MTN-Qhubeka riders up front. I could see the day with Manel was going to be an experience! I’ve never seen a man able to talk on two radio’s, refer to race notes, keep a track on a live in-car TV feed and drive a car all at the same time! We started the first ascent where immediately we passed Cavendish struggling with some other back markers. This was a day for the climbers who relish the cruel serpent-like twists of the mountains. The next few hours where like nothing I’ve ever spent before. 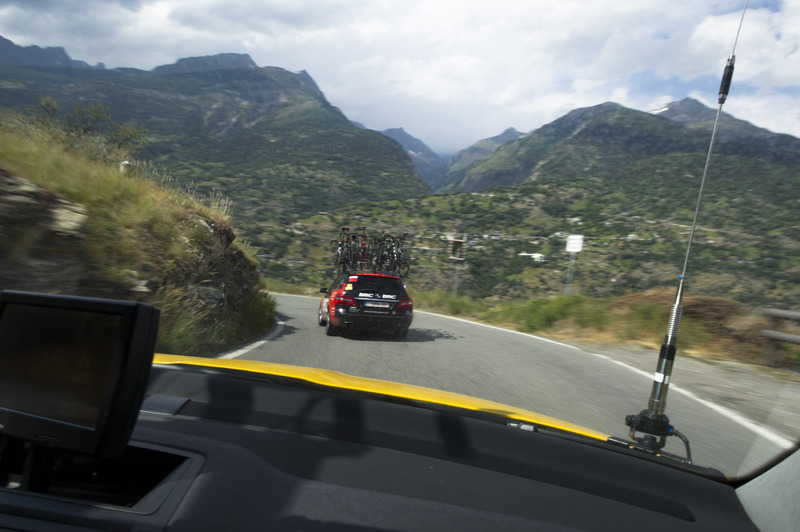 I’ll be honest, at times I was verging on scared as Manel navigated his car three abreast around the meandering mountain roads as each team raced to support their riders, providing bottles and passing on instructions. He reassured me it was all totally safe – reminding me he’s from Barcelona where they all drive like that! Joking aside however, these guys know how to drive and have tremendous respect for one another. The riders on their carbon frames can descend far quicker than any car – it’s our job to keep up! 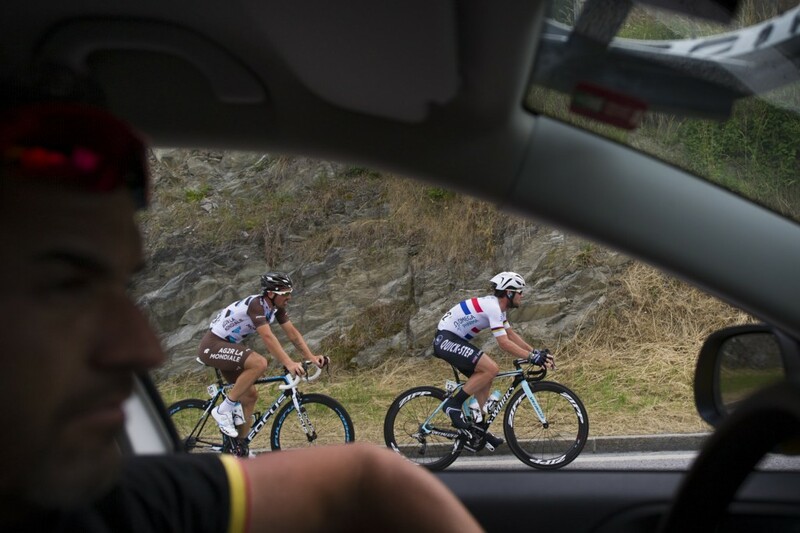 I kept asking myself ‘How often does a cycling fan get to sit in the actual director sportif’s car mid race? !’ The adrenaline- fueled ride was one to savor. The race started to take its final shape as Rui Costa, Bauke Mollema and Mathias Frank attacked Tony Martin, the yellow jersey holder, within 40km’s of the finish. MTN-Qhubeka’s top ranking GC rider Sergio Pardilla missed the attack but the team’s young star Louis Meintjes assisted Tony Martin with the chase to track down the trio to the finish. Ultimately, the power of World Champion Rui Costa was too much to bridge and with 4km’s to go Louis pulled back to join the main group where he and Sergio would finish 34th and 13th respectively (Sergio taking 12th overall in the GC for the Tour). Costa would go on to win the stage. During the course of the day, I was so impressed with the talents of this Pro-Continental team from Africa – they were competing on the biggest of stages and dropping riders like Andy Schleck in doing so. This wasn’t a team just turning up to participate and promote their humanitarian values, it was team looking to win and, in doing so, put Africa firmly on the cycling map. 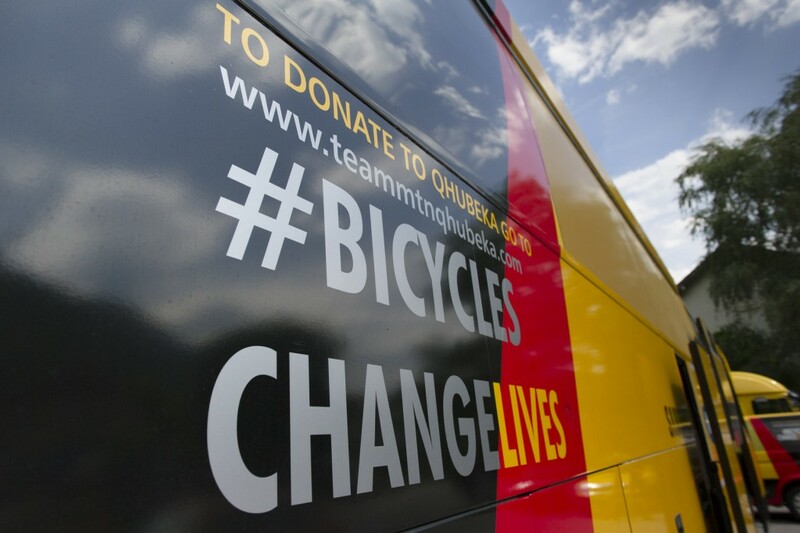 To sum up Douglas Ryder’s Team MTN-Qhubeka it would be only right to use their own slogan – ‘Bicycles Change Lives’. Doug’s passion and drive for the sport combined with his unique dream to empower third World African communities though racing is truly awe-inspiring. Thanks to the incredible efforts of World Bicycle Relief, this dream is happening right now. I would recommend that anybody takes advantage of the opportunity to join the team as part of the VIP Participation Program on their next tour – the cost of your participation will donate Buffalo Bicycles to students in Africa. In return you’ll experience an unforgettable day that any cycling fan will remember for a lifetime.